Social Psychology by Elliot Aronson (University of California, Santa Cruz), Timothy D. Wilson (University of Virginia) and Robin M. Akert (Wellesley College) is one of the books that has made the greatest difference in my life. In fact, I would call it the “great eye-opener” for me, enabling me to acknowledge my own right to truth. An immensely painful journey was what lay ahead of me, one that went against what I had previously thought true. Of course, this did not happen solely due to Social Psychology, but Social Psychology was what enabled me to ask the right questions about the world. 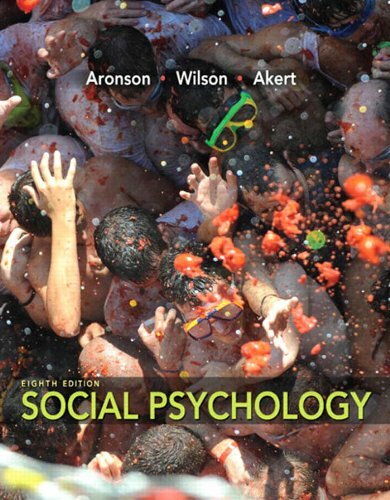 As you might have guessed from the title, Social Psychology is a book about social psychology. It happens to be meant for students taking psychology classes and costs a whole lot. The version I have, is the second edition published in 1997. The current edition is the eight and updated from my older one. Today I just added a few trailers and films to the left sidebar. From my own observations and the examples in Social Psychology getting ourselves to see another person as “other” allows us to accept and do unto others actions we would not so easily accept being done or doing to our own people. We/them, people/objects, worthy/unworthy or good/evil labels added to other people allows us to rationalize what we do and accept. Some of the experiments that illustrate this gave results that were somewhat surprising at the time. The famous Stanford prison experiment showed how seemingly decent people did terrible things to others given the right circumstances. Stanley Milgram and his team showed how far people were willing to go in hurting others given a uniform was present. I doubt being autistic/aspergian makes it any easier/worse to discover how convoluted human thinking is. At first I resisted, then I observed and read some more. Eventually, I had to accept that I was no different than others, and that acceptance has made it slightly easier to recognize what is going when it happens and to adjust my own actions. And when I rationalize, am being a hypocrite or join in group thinking something goes off in my brain and I am able to decide whether I want to continue the behavior. Perhaps the greatest advantage to being aspergian (at least a highly functioning one) shows itself in what happened once I realized that the authors of Social Psychology might be correct. We go off on tangents in our lives and become extremely interested in something. I need the written word. Television and films often overwhelm me. But books and the computer screen are fine. So I read A LOT. Which is what I did and do regarding social psychology processes. Now, with 50 being right around the corner, I find it impossible to view others as evil/bad/them once I get time to take a breath and think. Often I disagree with their way of thinking. Sometimes I think that people are incredibly stupid with the tools they use to get their point across. But to them it all makes sense. Some people think of me as bad/less/outsider/evil and that is fine. Sad, but fine. Why should they be exceptions to the social influences we all come under?